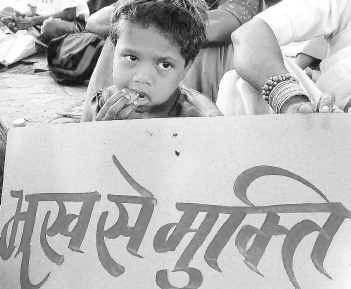 The First "convention on the right to food and work" was held in Bhopal, 11-13 June 2004. The venue was Gandhi Bhavan, Bhopal. Organisations committed to the right to food and work joined the convention from all over the country. The main purpose of this convention was to share experiences of grassroots action for the right to food/work, and to plan future activities. This was also an opportunity to address the organisational issues that arise in building coordinated action for the right to food and work. This was an action-oriented event, with plenty of discussion groups, training workshops, cultural activities, and more. It was a unique chance for persons working on the right to food to meet like-minded people from all over India and learn from each other. Isues for discussion included guaranteed employment, the public distribution system, mid-day meals, land rights, and judicial action for the right to food and work, among others. World Social Forum in Mumbai (January 2004). It is facilitated by the support group of the “right to food campaign”, in collaboration with several country-wide networks such as the National Alliance of People’s Movements (NAPM), Bharat Gyan Vigyan Samiti (BGVS), Jan Swasthya Abhiyan (JSA), All India Democratic Women’s Association (AIDWA), National Federation of Indian Women (NFIW), Human Rights Law Network (HRLN), National Conference of Dalit Organisations (NACDOR), National Campaign Committee for Rural Workers (NCCRW), People’s Union for Civil Liberties (PUCL) and The National Campaign for the People’s Right to Information (NCPRI).